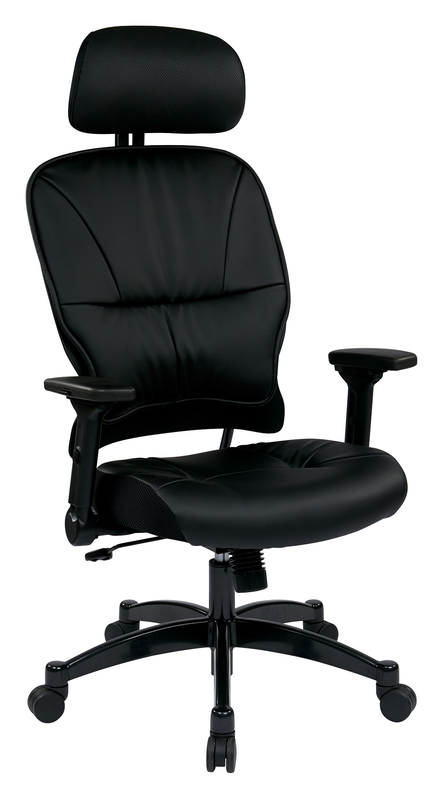 Unsurpassed up-to-the-minute design arrives in the form of the professional Space black bonded leather manager’s chair. This intelligently designed chair provides both comfort and support to your body and mind with its thick padded contour seat and back with built in lumbar support which will afford for hours of cozy seating, minimizing fatigue and alleviating pressure on the spine. A one touch pressurized pneumatic seating adjustments allows you to elevate to the perfect height, while the 2-to-1 synchro tilt control, with adjustable tilt tension helps to personalize this chair to everyone’s particular needs. Height adjustable arms with soft PU pads allows for a comfortable and cozy place to rest your hardworking hands. A gunmetal finish aluminum base with over-sized dual wheel carpet casters lets you to glide effortlessly across the floor.